Lighting-Gallery-net - good ol' mercury vapor/Tungsram 175w HGLi lamp from 1979. What a surprise! Tungsram 175w HGLi lamp from 1979. What a surprise! Never knew Tungsram made US spec export mercury lamps in the 1970s! I know they did in the 1980s for OEMs like with yardblasters. The 1979 lamp here differs from the 1980s ones. The base, actually a Sylvania base, is secured with basing cement rather than using threaded glass. The inner construction is similar to the earlier isothermal lamps. Even has a mica deflector. Works great, makes a rather pale color compared to new DXs made in the USA. Nice, made in the year I was born in. 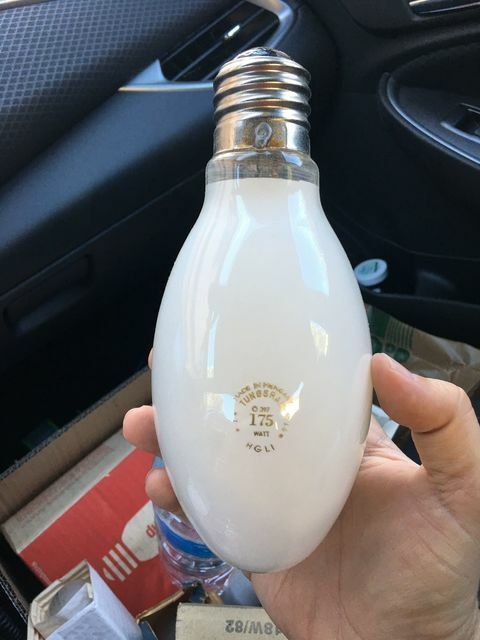 I didn't know that Tungsram made lamps for the US market. I agree Dave, nice Score. I now need to look back at all my HgLi's...I think all mine are 1980's models with conform-fit bases. Hey Dave, can I just have a little rat through that box? That's a beauty. I was only just walking when that was made! Most intriguing, I never knew such a thing existed. Very rare indeed to find a European-made 175W lamp. If I remember right from my visit years ago, don’t you also have an equally rare British GEC 175W mercury? I would love to see a photo of that again if possible! @ dor123: it was't in production for Hungary. In Hungary I have never seen a lamp like this (at all). I saw it in the catalogues, once I saw a few dosens in Hungary but those were from the 90's. The etch is a typical from 1979. "HGLI" Does it have a dome? Does it really originally have a Sylvania cap?